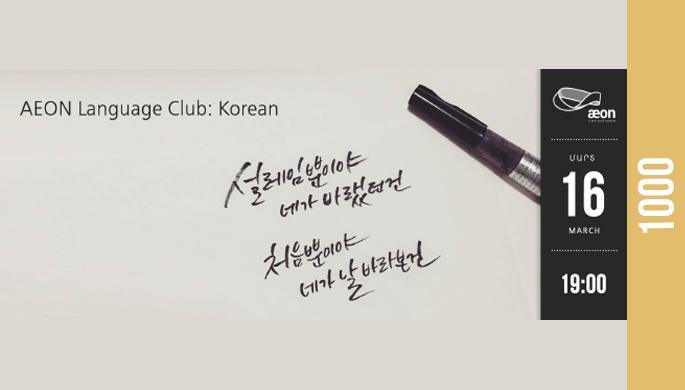 Our next Language Club gathering at AEON will be an introductory session to the fascinating language of Korean. It is aimed at beginners’ level, so you can come even if you don’t know any Korean. During our session, we will discover the history behind this very unique language, which has no relation to any other living language. We will then learn the story behind the Korean alphabet: the meanings of each letter, and how words are constructed in written Korean. Finally, we will learn how to say basic phrases in Korean. Our teacher will be Simona, a Birthright volunteer from Russia who has lived in South Korea and visited North Korea on several occasions. She will share her fascinating knowledge and experience with us next Wednesday at 7pm at AEON. Hope to see you there! Discussion will be mostly in Armenian and English, with parts in Korean. The entrance for this language club is 1000 AMD, including AEON’s usual drinks and snacks.